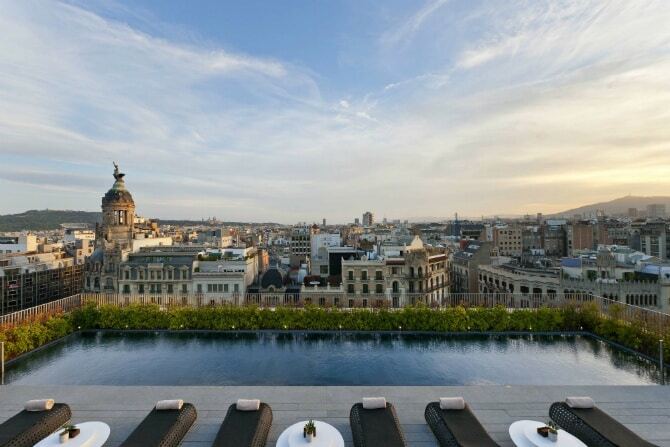 The rooftop terrace pool at the Mandarin Oriental Barcelona hotel overlooks the city and is another great way of experiencing the stunning Catalan capital. 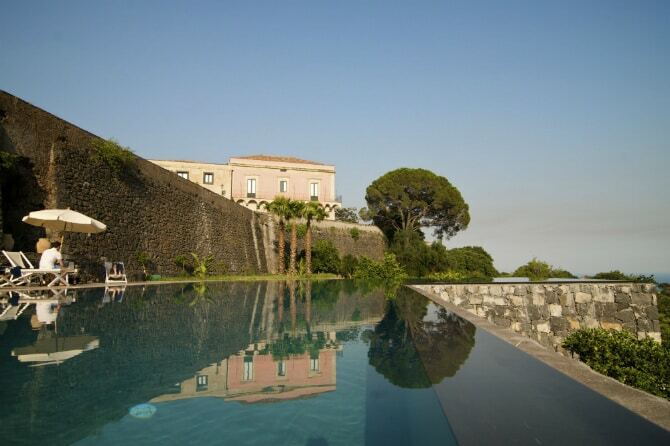 The recently renovated Rocca delle Tre Contrade villa sits at the foothills of the majestic Mount Etna and offers unparalleled views of both Sicily and the Ionian Sea – especially from its 25-meter, L-shaped infinity pool. 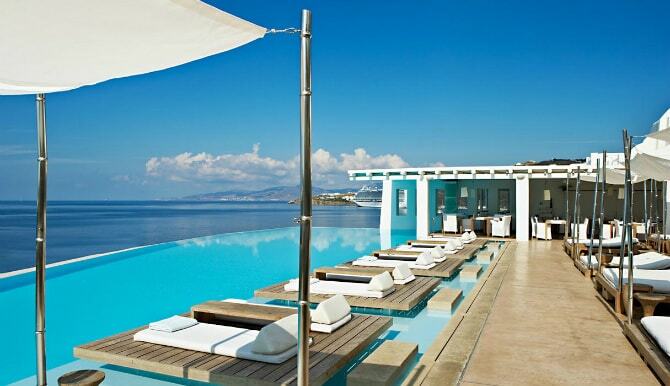 You’d be hard pressed to find a better place on the Island of Mykonos than Cavo Tagoo’s pool lounge area. Guests can enjoy unparalleled views of the island and the sea from the stunning infinity pool, while a special lighting changes the color of the water to great effect. 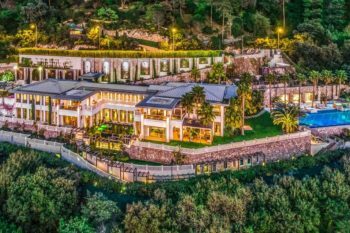 Located on the eastern coast of Sicily, the Metropole Taormina hotel was recently re-opened, four decades after closing down. 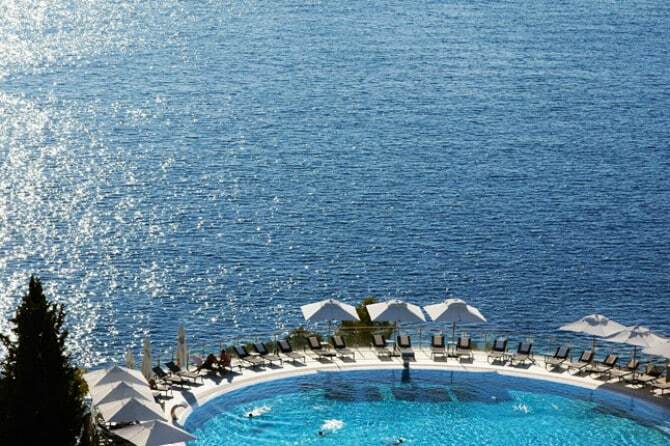 In addition to the private beach, the resort also has a swimming pool which offers breathtaking views of the bay. 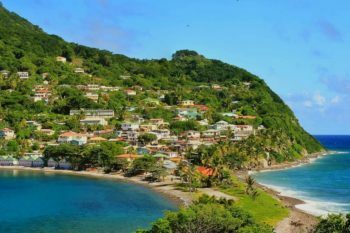 Lots of the pools on this list can be found on seashores, or tropical paradises, close to other great stretches of water. But what about one where you wouldn’t expect it, like high up in the mountains? We give you the pool at the Adler Dolomiti Spa and Sport Resort, which makes up for the lack of nearby palm trees with jaw-dropping views of the Italian Alps. Tortuga is a traditional gingerbread style villa with a little bit of Italian charm, located on a hilltop overlooking Britannia Bay. 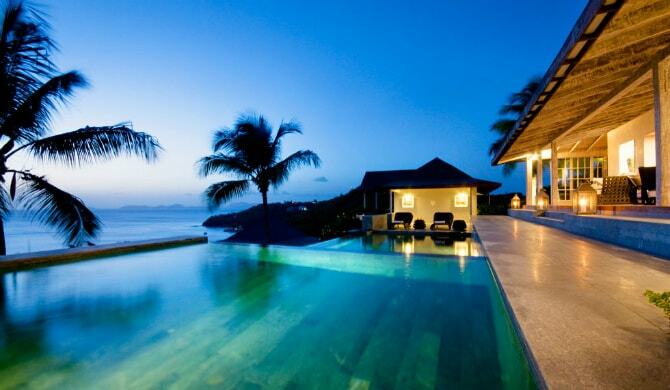 It features a stunning 52-foot cascading pool, with waters of the same shade of turquoise as the Caribbean Sea. 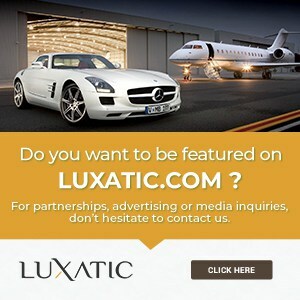 The resort town of Dubrovnik, Croatia, is one of the hidden jewels of the Dalmatian coast. It is host to a number of nice hotels, including the Sun Gardens, with its circular pool overlooking the Adriatic Sea. Udaipur, set in the very heart of Rajasthan, is one of India’s most charming and romantic places, even earning the nickname of Venice of the East. 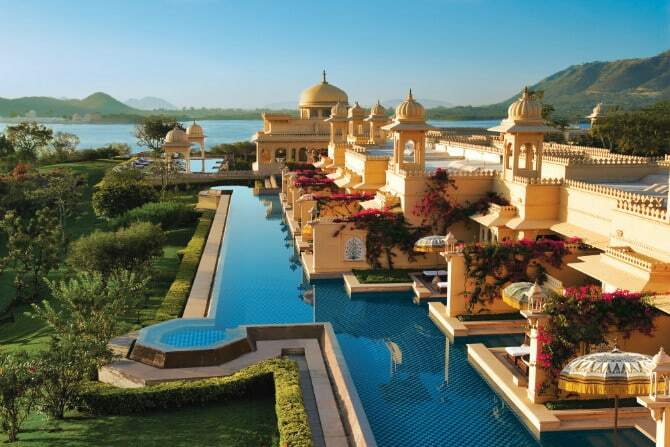 It is home to lots of beautiful lakes, but also to the picture-perfect Oberoi Udaivilas, a five-star hotel like no other. As you can see from this photo, the hotel’s swimming pool is so big I wonder how they keep it clean. Is it the old traditional way, using one of these smart machines, or something else? 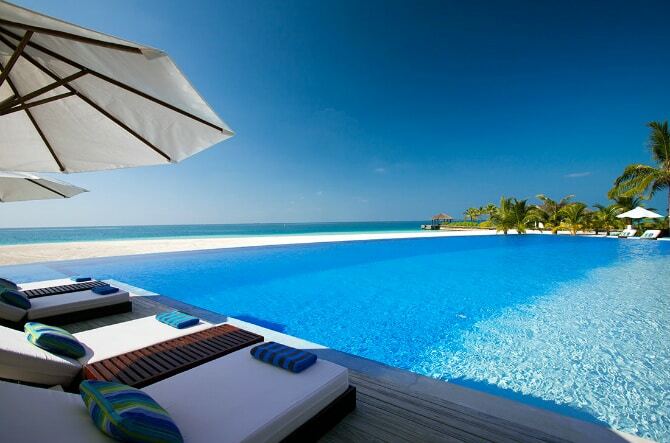 Velassaru Maldives is a little piece of paradise on Earth. Secluded, yet luxurious, surrounded by the warm waters of the Indian Ocean. It’s tough, however, to choose (or even distinguish) from the ocean and the resort’s amazing pool (which gets even better at night). Another place that owes much of its charm to its location. 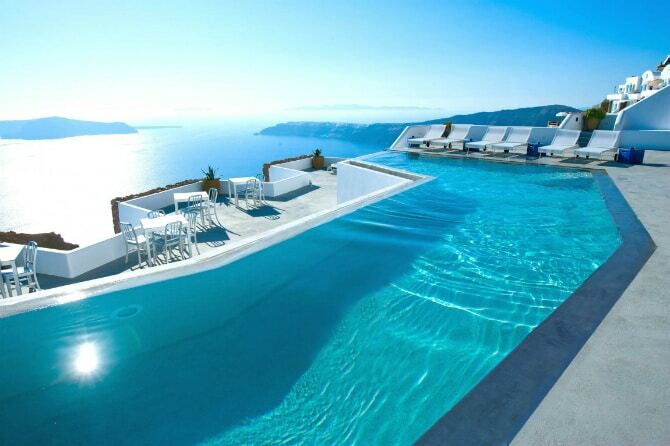 The infinity pool at Grace Santorini seems to borrow something from the breathtaking Caldera that stretches beneath. 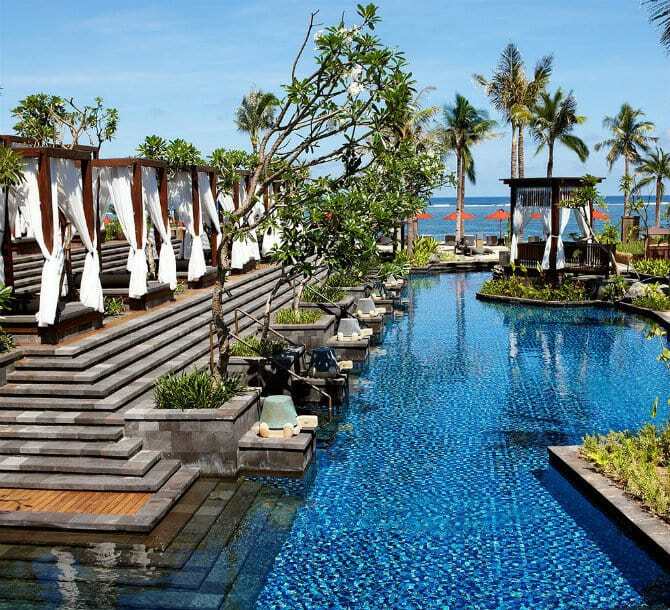 The award-winning St. Regis Bali Resort is well known for its splendour, as well as its great location along a wonderful stretch of white sandy beach at Nusa Dua. Greatly adding to its allure, guests can enjoy a number of beautiful lagoon-like pools. 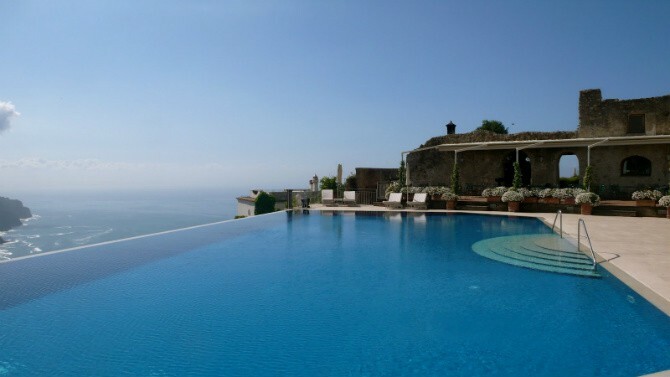 The Belmond Hotel Caruso is a fine resort located on Italy’s breathtakingly beautiful Amalfi Coasts. 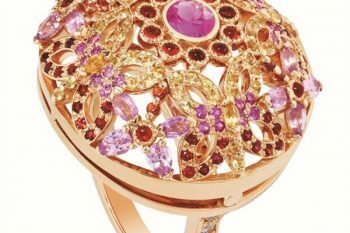 It features a stunning infinity pool set at the highest point above the town of Ravello – seemingly floating among the clouds. 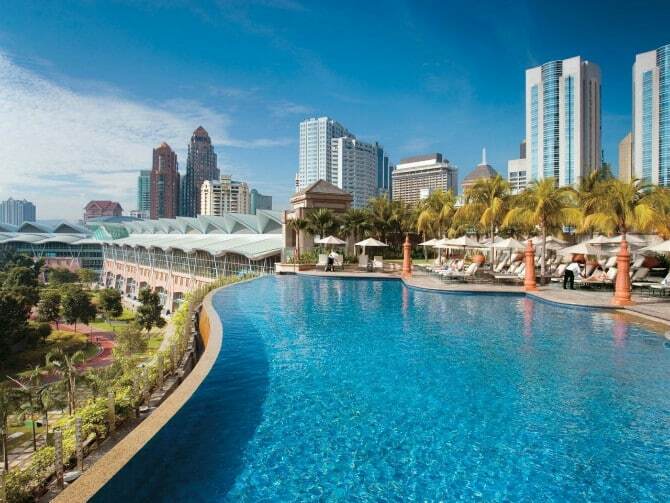 Ideally located between the Petronas Twin Towers and Kuala Lumpur City Center Park, the Mandarin Oriental, Kuala Lumpur Hotel also features an amazing roof-terrace pool overlooking the Malaysian capital skyline. One of Vietnam’s premier resorts, The Nam Hai features some excellent accommodations and a great spa in the middle of a lotus pond. 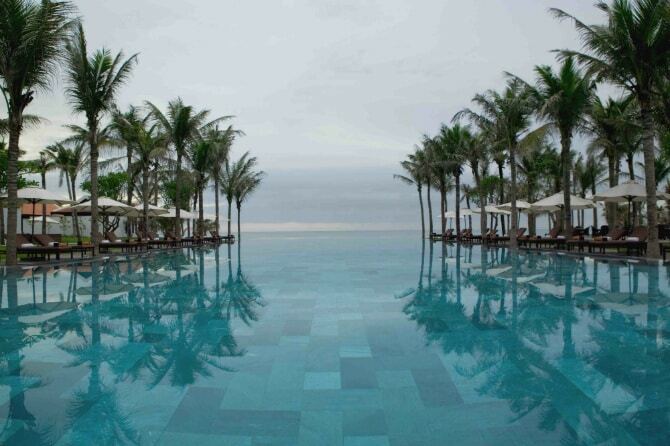 Equally impressive are the three extensive pools, which sometime seem to blend in with the sky and nearby sea. 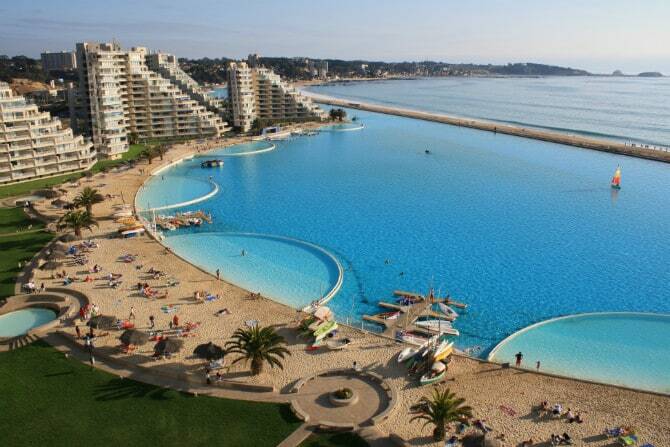 The Chilean resort of San Alfonso del Mar boasts the largest swimming pool in the world. 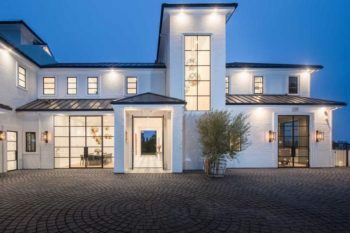 The water for this 20-acre pool is pumped, treated, and filtered from the Pacific Ocean (which is just a stone’s throw away). The Qasr Al Sarab Desert Resort by Anantara is a luxurious retreat set among the dunes south of Abu Dhabi. 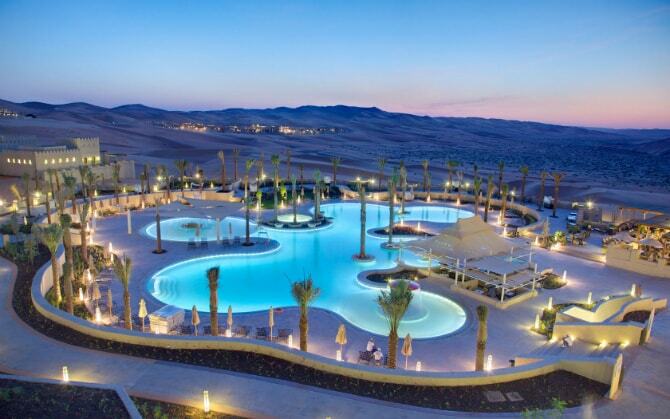 At its center lies a wonderful swimming pool, like an oasis rising out of the arid landscape. Thailand is one of Southeast Asia’s best tourist destinations, with plenty to see and lots of welcoming resorts providing accommodations. One of these is The Library, located on the picturesque Koh Samui. 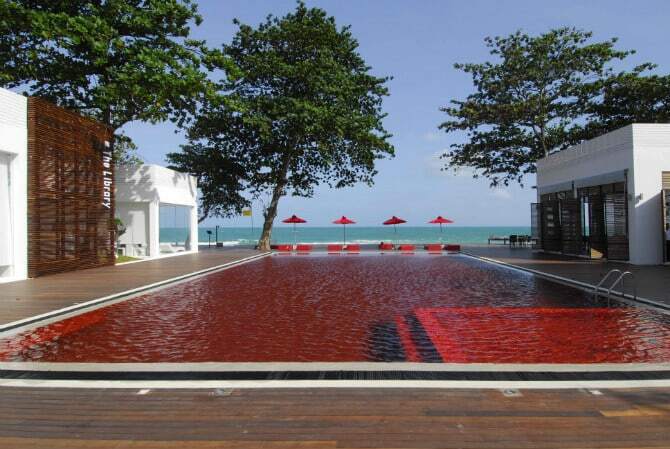 Especially eye-catching is its unique blood-red tiled swimming pool – an impressive sight, though not for the faint of heart. 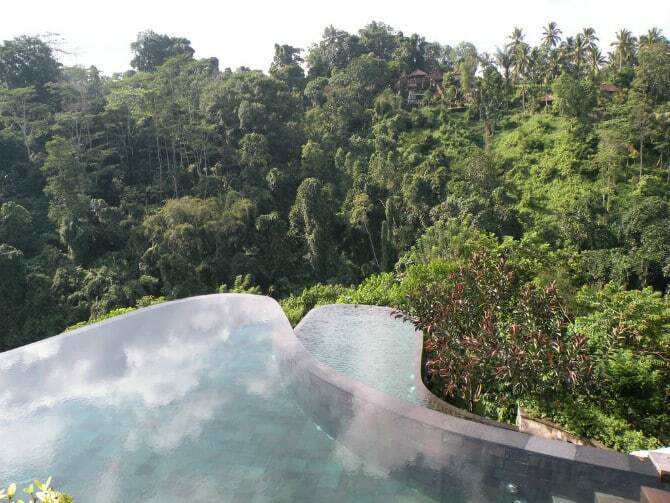 Just like the Ancient Wonder of the World its names it echoes must have been, the split-level infinity pool at the Hanging Gardens Ubud, on the picturesque island of Bali, is a truly awesome sight, set into a cantilevered platform overhanging the hotel. 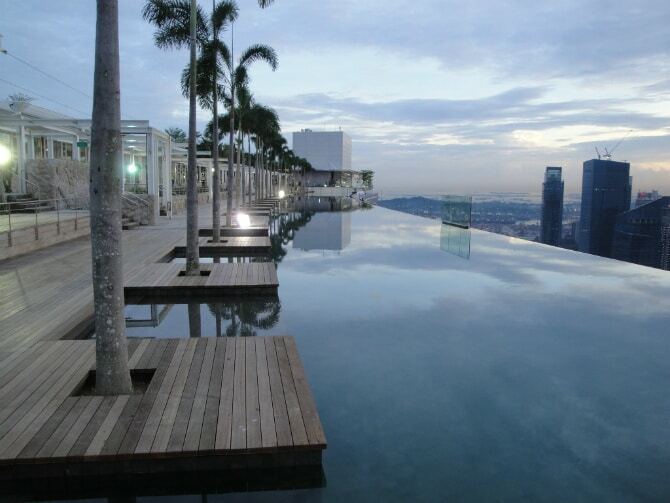 Located on the 57th level of the Marina Bay Sands Hotel, the world’s most expensive building, this stunning 150-meters-wide infinity pool offers breathtaking views of Singapore. Alila Villas Uluwatu is an enchanting resort located on the beautiful island of Bali, a place that is as interwoven with nature as a luxury hotel can be. 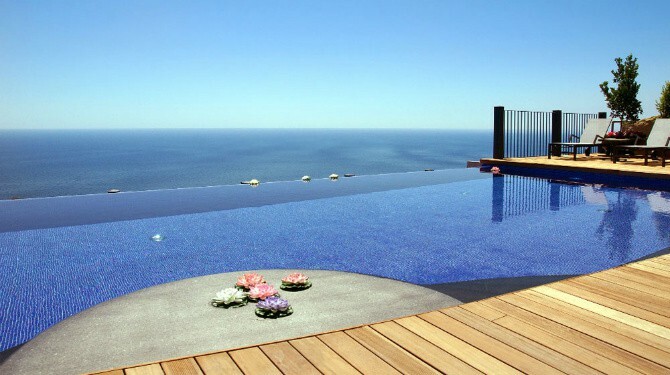 Perched on top of a plateau near the ocean, it is the perfect location for an amazing swimming pool at the edge of the cliff.